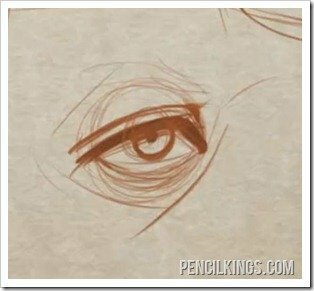 Ready to learn how to draw eyes on a face? 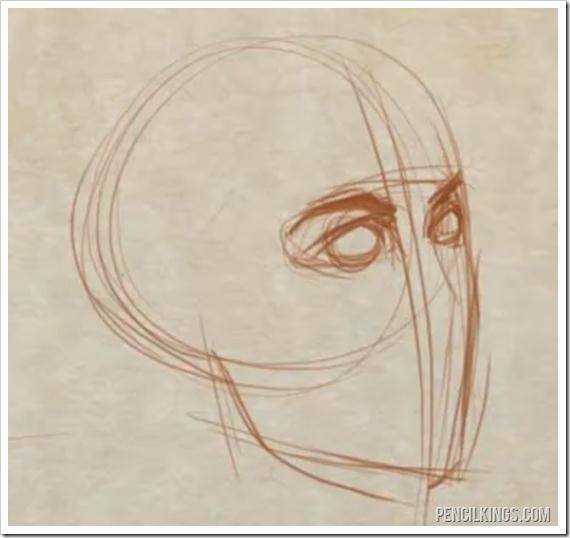 Start off by adding a vertical line through the head to establish a mid-point. 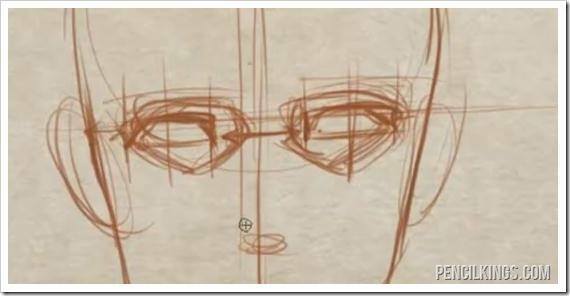 Then, draw a horizontal line through the head for where the eye line should be. 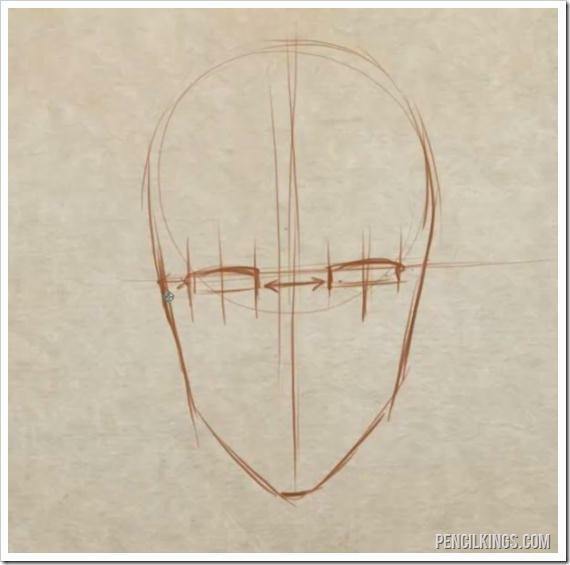 If you need additional help on creating the head, you can look at the head proportions foundation series. The entire width of the face at the eye line is four eye widths. Each half of the face is two eye widths wide, with the eye taking up one eye width, and then half an eye width on the outside of the eye, and another half an eye width between the eye and the mid-point of the head. 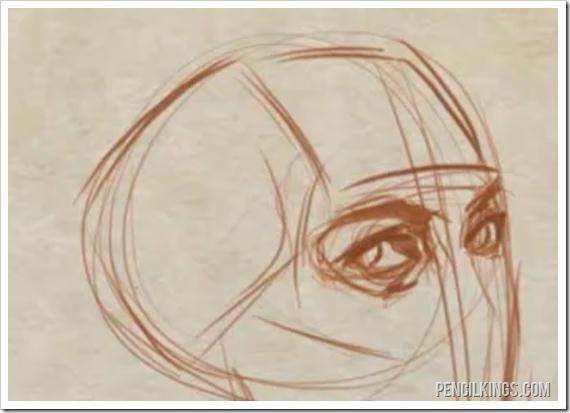 While dividing up the head into eye widths is one common way to start, a better way is to think instead of the skull and the actual eye sockets and how they determine where the eyes are going to be placed on the face. Here’s another great tip when learning how to draw eyes on a face: Try taking your fingers and feeling your own eye socket. If you are doing this in front of a mirror, take note of what the difference is between your eye socket (the actual bone of the skull) and the placement of the eye. Notice how much larger the eye socket is, and then also notice the placement of your eye brow and the folds in the eyelids in relation to the socket. Here is another example from the front view that is showing the construction lines for the eye socket as well as the basic structure of the eyelids inside of the sockets. Always darken the upper eyelid because it is naturally going to be in shadow, as well as contain the bulk of the eyelashes. Remember to shade the upper part of the eyeball and iris. Add some shading to the lower eyelid. Remember to define the socket of the eye to help with the placement of the eye on the face. Add in the fold on the upper part of the eye. When you have place the eye sockets on the head it serves another purpose, and that is to understand the planes of the face. [/one_half_last]And that’s it for this article on how to draw eyes on a face. We’ll dive into this more fully in another lesson, but it’s a good way to quickly be able to map out the different major parts of the skull. And, once you’ve done this, you’ll understand what you need to do for lighting and shading your character.